EHX do a TS with no BS - and at a very reasonable price, too. Natural overdrive tones. Offer its own take on the JRC4558 pedals. Good value. Try before deciding to replace your Tubescreamer. Stompbox aficionados will know all about the JRC4558 chip/ integrated circuit residing in Electro-Harmonix's latest dirt box, the East River Drive. "EHX had lots of requests for a pedal based around a JRC4558 chip - the East River Drive is designed to fill that gap"
It's found at the heart of some classic overdrive pedals: the Ibanez TS-808 Tube Screamer being the prime example. 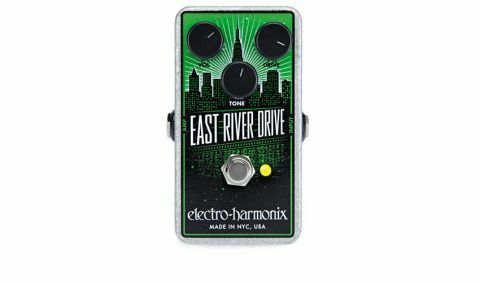 EHX apparently had lots of requests for a pedal based around a JRC4558, so the East River Drive has been designed to fill that gap. Like the Tube Screamer, the pedal also uses symmetrical clipping. The ERD can operate as a boost with drive at a minimum; the tone knob dialling in extra top-end presence. After that, the drive knob brings in a very natural overdrive sound from just breaking up to a medium raunch. So is it a Tube Screamer clone? Well, side by side with our TS-808, we found it very similar in scope, albeit with slightly less of a hump in the midrange. Whatever its provenance, this is a very natural overdrive for adding some dirt to a clean amp or taking a driven amp to another level.